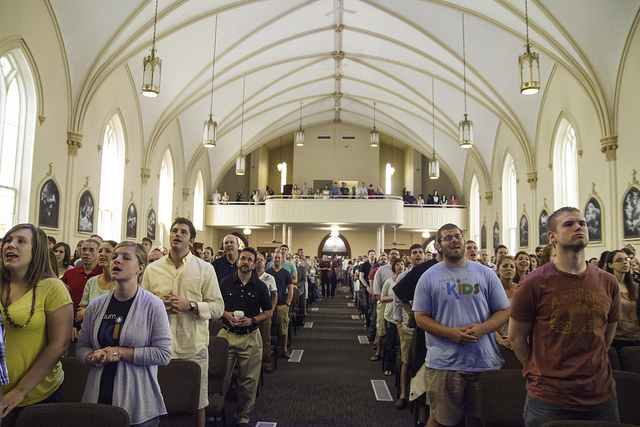 Sojourn’s Midtown campus meets this summer in the new facility for the first time. The story of St. Vincent de Paul, a Roman Catholic church in Louisville, Kentucky, is like many others in our age of changing religious and economic dynamics. Cornerstone laid in 1878. Slowly abandoned as the neighborhood deteriorated into one of the most dangerous in the United States. Finally sold. But here the story takes an unexpected turn, because the building has recently enjoyed a $4 million makeover from a young, vibrant, and growing congregation. Sojourn Community Church began meeting in an arts center in Louisville’s Germantown neighborhood before it purchased St. Vincent de Paul a few years back from the local archdiocese. The upgrades signal a multifaceted effort by Sojourn to trust God for spiritual and economic renewal in this inner city neighborhood. In fact, Sojourn is one of several prominent churches across the country undertaking multimillion-dollar renovation projects to breathe new life into historic churches or other structures, instead of building a contemporary big-box.